Sometimes kids are more resilient than we think. Our shortstop Zach got hit really hard one day while putting the tag on an opposing runner sliding into second base. By time I got out to him he was writhing in pain, tears and infield dust. He was fairly small, so I just picked him up and carried him over to his mom who was sitting by the sideline bleachers. Figuring he was in good hands, I got distracted by a question from another parent. When I turned to see how Zach was doing he was gone. His mom pointed toward home plate and sure enough, he had a bat in his hands and was on-deck waiting to hit. Pain gone, tears were history and only the dirt on his uniform remained. Tough kids aren't always tough. Alex had at least twice the testosterone that most teens are allowed. Nothing was done half way or at less than full throttle. Unfortunately (and criminally it could be said) during one game, the opposing catcher while in full gear punched him in the face with a baseball still in his hand! Before the umpire or myself could reach the scene Alex already had the kid on the ground and was preparing to pulverize him despite having a broken ocular socket. Tough? I would say so. However, a season or two later he volunteered to help coach a group of younger players. I accepted his offer and was pleasantly surprised to see Alex to be a patient, understanding and gentle instructor! Tough and gentle are not mutually exclusive. Risk management is not something that crosses the radar screen of any teen age boy I have ever known. I do not know how many times I have been watching one runner going home to score from the third base coaching box only to turn and see a guy who's nickname is invariably not "wheels", chugging in to third base only to get thrown out by 20 feet. When I try to explain to the boy that we are behind by 4 runs, every out counts so that trying to advance one more base was not worth the risk, I always get a blank stare and the declaration: "I thought I could make it coach." 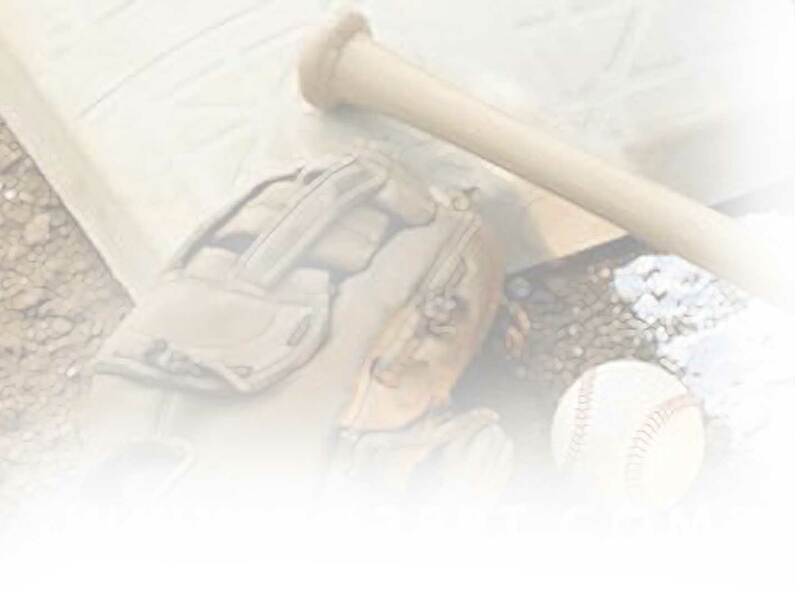 Insurance underwriters must have coached youth baseball. Chris was part of my first team in 1983. Fifteen years old, overweight, unpopular and a little clumsy, he was not one of our star players. He wanted desperately however to play first base. Unfortunately for him Andy was an excellent first baseman, one of the best we've ever had. I gave Chris an old first baseman's glove of mine that had definitely seen better days and told him he would get a chance to use it before the season was over. He re-laced and conditioned it until it was practically new. The boy had to leave the team before the season ended to take a summer job, so at the start of his last game I asked Andy to go play center field, put Chris at first and held my breath. Leading by a run in the last inning with one out and the tying run at second, the opposing batter hit a ground ball to our shortstop who proceeded to make an awful throw to first. Chris did a ballerina style full split to scoop the ball out of the dirt for out one, came up without hesitation and fired the runner out attempting to advance to third. Game over. Although the other kids gathered around him and would have carried him from the field, I am sure it was not necessary, because his feet were solidly off the ground anyway! Walking on air and hopefully savoring what was probably the last time he ever played baseball. One evening over a decade later, we were on our way to getting beaten pretty solidly. I put in our 5th string reliever who happened to be my kid to eat some innings, get clobbered and save our better pitchers for the next day. I also replaced our clean-up hitter who has batting about .450 that season to accommodate a substitute player to get him some playing time. Turning the team over to an assistant coach I then took a little walk. Imagine my surprise when I returned to find that that the opposing team had not scored a run in 2 innings. We rallied back in the last inning until we trailed by only one run with 2 outs and the bases loaded. Then who should come to the plate but Jordan, the substitute instead of our aforementioned clean-up hitter. I was still busy kicking myself when Jordan hit the game winning single to right center field! Pretty smart coaching! Always take credit even when it isn't due! I always laugh when analysts look at a coaching decision after the fact as though the decision had anything to do with the outcome. Let the football coach decide to "go for it" on 4th down late in the game and he has either taken a brilliant calculated risk or made a huge blunder. It depends on if the play makes the first down and who wins the game! The investment banker who invests a huge amount of money in a start up company either gets kudos for a smart money move if the business succeeds or is castigated for malfeasance if the business fails. Who has the courage to laud or critique to decision BEFORE the outcome is known? Once in a game I had forgotten to assign anyone to right field. Just as our pitcher was going into his delivery, I hastily told Holden to go to right. He barely had time to get into the playing field when the batter hit a line drive down the line and right at him for an easy catch. "Way to position your guys coach!" I did not disagree. David was not our best hitter. Despite all efforts he had not had a hit all season. He was at bat during the season end tournament when the opposing coach loudly exhorted his pitcher: "just throw it over the plate, this kid can't hit it!" I strolled over to the coach and was just in the process of explaining to him that this was probably not a very nice thing to say, when David belted the next pitch into center field for his first and only hit of the season. It helped us win the game. We also won the tournament. I could have saved the trip although the coach did apologize. One spring season our 14-15 year old team was doing pretty badly. Batting averages were dropping like the Dow Jones, final scores were looking like football games and our pitchers were posting more walks than a dog park on a Sunday afternoon. The harder everyone tried the worse we did. What we needed was to lighten up and realize this was just baseball. 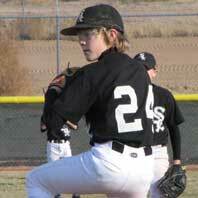 I called up a 12 year old reserve player who never walked anyone, but whose fast ball was more like a slow change up. I put my cowboy hat and boots on and we got ready to play ball. We over shifted so radically that with right handed batters the second baseman was playing on the bag, the left fielder was on the foul line, the center fielder played left and the right fielder was in center. Only the grass was covering right field. When a lefty came to the plate, I swung the fungo bat like a war club, yelled "shift" and we moved just as radically the other way. Twelve year old Carson did what I asked him to do for 7 innings. He never walked a batter. Even though the other team had 17 hits including 2 triples, they only scored five runs! We lost the game 0-5 but everyone left the field with a new perspective on themselves and the game. Carson left the field grinning from ear to ear having had a ton of fun pitching against kids much older and bigger and having done well at it! Many of my players pursued their goals in baseball with great persistence, perseverance and patience. Julian was on my team for many years and every year he tried out for his VERY competetive high school team. Every year he was cut. One spring in his senior year he can into my little store to tell me he could not play for me anymore. 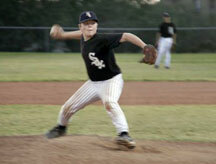 He had finally made the team as a pitcher in his last year - an unheard of feat at that school. When my wife was critically ill and dying I had to walk away from the team but appointed Julian to take over even though he was only 17 at the time. He did a great job. He went on to college at UA albeit not as a player, BUT his passion for baseball never waivered. He graduated in 2015 and now works for the Boston Red Sox working in the finance department. Steve O. made the same high school team in his freshman year but was cut in his sophomore year. 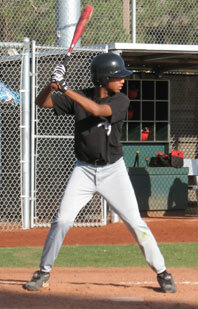 He returned to us for two seasons and continued with private professional instruction. His last two years he was a starting pitcher on that high school team and helped them win a state championship. He went on to play college ball in Michigan and now has a career in sports medicine. Vince Lombardy was WRONG! His memorable axiom that "winning is not the most important thing, it's the ONLY thing" has poisoned the realm of sports ever since. What happened to "it doesn't matter whether you win or lose, it's how you play the game?" Play hard, play fair, try your best to win but be gracious in victory or defeat. The concept of teamwork and respect for the game, the officials, your team mates, spectators and your opponents all seems too often to be overshadowed by the Lombardy notion of that winning is all that matters. I have seen this false notion all too often in youth sports. Kids being verbally abused or humiliated by players, coaches and parents because they failed or made a mistake is not what youth sports should be about. Many kids dream of big league careers but of course this is a one in ten thousand chance at best. Parents also have big dreams of sports scholarships or living vicariously through their children's accomplishments. These notions are the antithesis of love of the game, honest competition, growing skills, and perhaps learning social life lessons that will endure long after the time for sports is over. And it is just plain wrong. I coached youth baseball ages 10-18 over nearly 30 years and over 45 seasons and strived mightily to avoid the "Lombardy syndrome." As both a player in high school and as an adult coach I was as competitive as I could be and we always strove our best to win but it was not the most important thing. For example, I heartily congratulated an 11-12 year old team of mine after losing a game 0-1. The game was played in record time because neither side made one fielding error which is virtually unheard of at that level. I asked the umpire Brian how many times he had seen that cleanly played a game. His response: "Never." And he had been an umpire for well over a decade. Many of my players went on to play high school and college baseball and many more went on to successful careers. Many condescend to be my friend on Facebook and this makes me deliriously happy. If my method contributed just a little to them leading happy, enjoyable and fruitful lives, I am a very happy camper. "What is the definition of a strike?" Invariably I get all kinds of answers (right and wrong) defining the strike zone. The answer of course, is simple: A strike is whatever the umpire calls a strike, whether we agree or not. Often life can be arbitrary and from our point of view unfair. Umpires are human and as such prone to err or even bias. Players need to adapt to this and carry on. Some umpires call a low zone, some like letter high fast balls. One thing is for certain: if we react negatively, even a roll of the eyes, we can make the strike zone even smaller. Keep it up and the zone can be reduced to the size of a basketball! Government, politics and business. Favoring kinfolk with kushy jobs, and unmerited promotions is rampant today. This starts with youth baseball. The Manager's kid invariably pitches, plays shortstop, bats clean-up or first in the order and never sits one inning on the bench. Assistant coaches are chosen based on the ability of their kids instead of their ability as coaches. The result: a couple of happy kids and Dad's and a bench full or resentful kids and parents. Of course, this approach is a sure bet to raise morale, productivity and loyalty in the business world too. One of the best compliments EVER given me by a player was "when I joined this team I had no idea you had a son on the team until Tyler asked you what was for dinner that night." Few things in youth sports are so sad as to watch a rough, tough 14 year old boy sitting on a fence crying because his parents could not be bothered to pick him up on time after a game. The same parents that never saw a game he played in but always attended his twin sister's events and would hardly think of missing the home pro football game they had season tickets for! I was not surprised when he chose a college far away from home. Another parent only had eyes for his oldest boy. Never mentioned the younger boy to me even though he had been on the team for a whole season. He apparently could never remember the names of the other boys on the team either. Every question, complaint and request revolved around the favorite son. Small wonder that when the "favorite son" tried out for a higher level of ball, the coaches opted not to choose the parent (or the kid). Never assume common knowledge is common knowledge. I learned this in the advertising business, but could have just as easily learned it on a ball field. I had one 13 year old boy who was constantly being called out on strikes on pitches right across the letters. When I asked why he was not swinging, he responded by telling me that the strike zone was from the belt to the knees and he was getting bad calls! I had assumed that by the age of 13 he at least knew the basic rules of the game! Even cultural common knowledge is fleeting. One day a boy did something nice for another kid on the team. I responded by saying to him: "You're a good man Charlie Brown!" He looked at me with a puzzled expression and said: "my name is Troy coach, you know that, why are you calling me Charlie Brown?" He had no idea I was paying him a compliment. Further conversation revealed that he had never heard of the famous "Peanuts" comic strip by the late great Charles Shultz despite TV specials or endless licensed commercial products. Charlie, Linus, Lucy and Schroeder were unknown. He had however, heard of Snoopy, thanks to Metropolitan Life Insurance commercials! In a hurry to leave for a ball game one Saturday, I snatched up my "cell phone" and put it in my jacket pocket. All was well until Austin asked to borrow my cell to call his Mom. Absentmindedly I reached into the pocket and handed him the device. Imagine my surprise when he said: "this is great for changing channels on a TV coach, but how do I make a call on it?" Leadership is earned and not appointed. Big Joey always gave 100% on the field and was one of our best players, but he was also always encouraging and understanding of others who did not do so well. Ready and willing to help out, or volunteer to sit the bench or play another position to allow one of his team mates a chance he led by example and force of his winning personality. When I finally got around to "appointing" him as team Captain, the general response from the kids was "so what else is new?" They knew he was the captain all along. Steve was with the team for two years. In that time, he quietly went about picking up equipment left on the field, arrived early to secure the best dugout and never had a word of anything but encouragement or praise for every player no matter what his ability or personality. The one most significant incident was a day at practice when we were running a throwing drill. Not involved in the drill, he took notice that a group of little girls were sitting and chatting awaiting their soccer practice to begin and were directly in the "line of fire" should an overthrow happen. He NEVER asked if he SHOULD, but quietly picked up his glove and positioned himself so as to protect them. Nobody noticed this except me. I have no doubt this young man will go far. We desperately need leaders like this! When little Eamonn started with us he could catch a baseball most of the time if it was thrown practically into his glove. A quiet and unpopular kid with a strange name who had not played much ball. While Eamon and I worked on his baseball skills Danny worked on Eamonn. Danny was tall, handsome, popular and one of the best players on the team. Every time Eamonn failed Danny was there to pick him up and tell him he would do better next time. Every time Eamonn did well, Danny was the one cheering the loudest. Danny's nickname evolved from "Dangerous Dan" to "Lieutenant Dan" to "Captain Dan" in the course of one season. 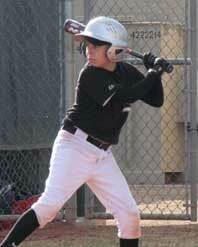 Eamonn played his second season with us at 2nd base, right field and one game catching. He committed NO errors and made some spectacular catches. I was pleased to award him with the Gold Glove for that season. Danny did not play with us that season, but his leadership was still in evidence. Reed played with us for 15 seasons over 6 years. Early on he was always complaining about some ache, pain or hangnail. I accommodated his ailments for a while until his mom came to me one day and said: "tell him to tough it out better and stop complaining." Reed indeed stopped complaining. He went on to play high school football, martial arts and while pitching in a game for us was hit on the knee by a screeching line drive back to the box. Another coach and I helped him off the field. 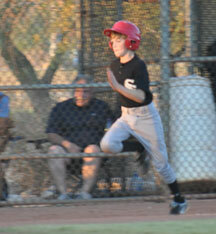 Not wanting to quit, he finished out the game in right field. He limped around for a week or two but never left our line-up!